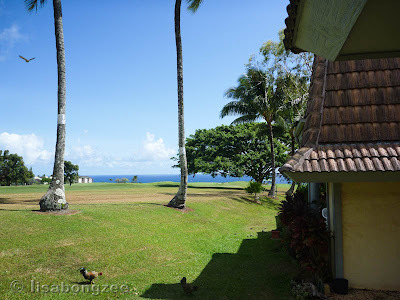 “The Road To Hana”, I would highly recommend taking the Ke’anae Peninsula detour (approximately half way to Hana). 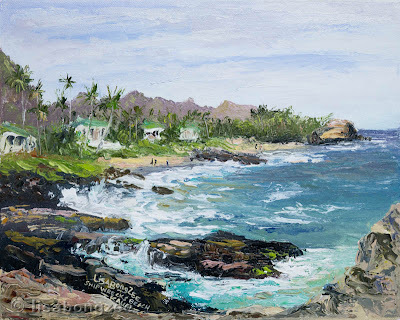 It is a quick little sidetrack that will lead you to a gorgeous, somewhat isolated tropical lava-filled shoreline with brilliant turquoise waters. It is such a beautiful place that you may end up as we did, spending the entire afternoon there, soaking in all the amazing scenery. 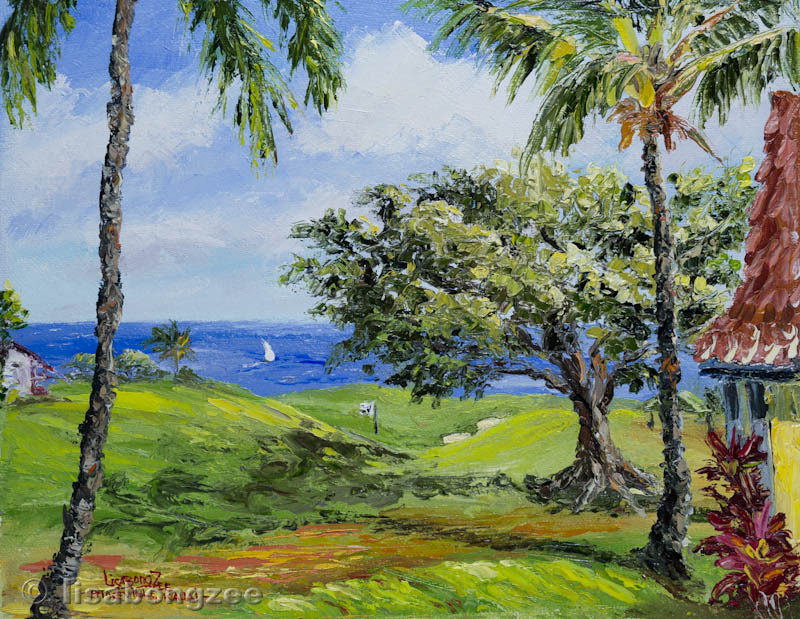 We never did make it to Hana! 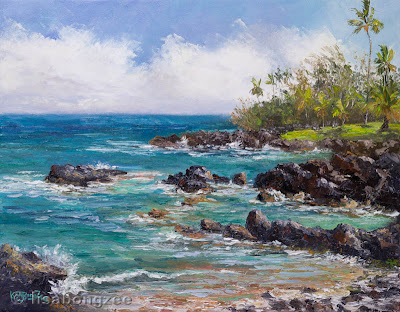 “Spectacular Detour” is an 11x14 palette knife painting of a beautiful section of the Ke’anae Peninsula - Maui, Hawaii. 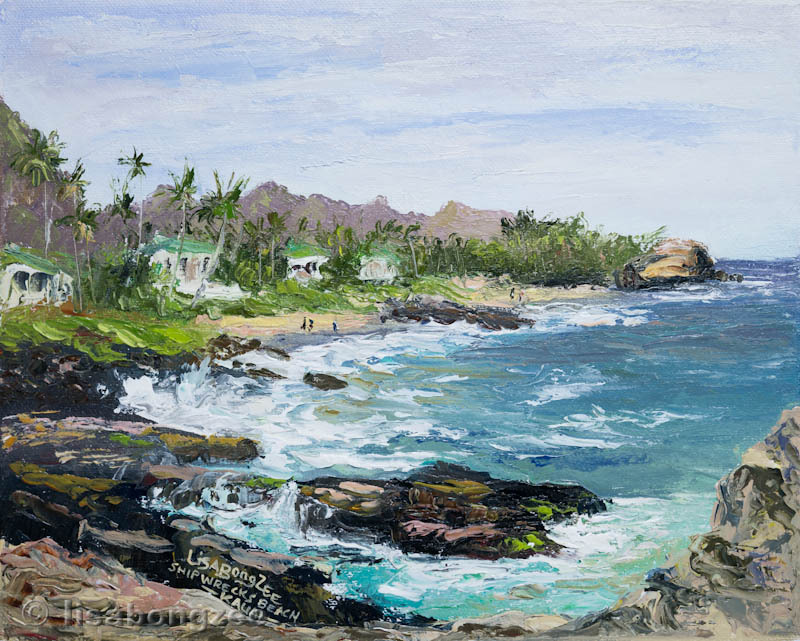 This is a gorgeous view you will find at Ko Olina, on Oahu's west side. 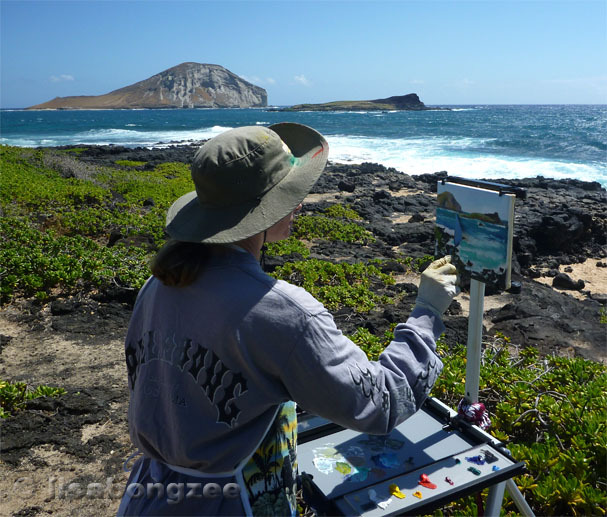 Some friends took me here to plein air paint one morning, and it was the first time I had seen these natural lagoons. is a 12" x 24" palette knife oil painting. 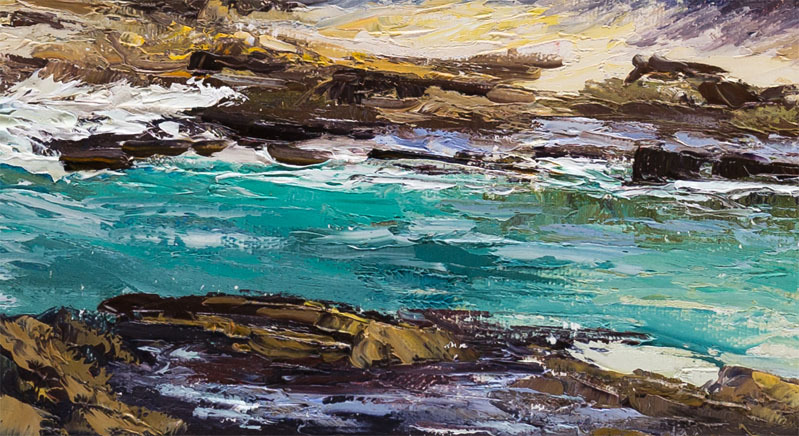 Close up of the palette knife texture. 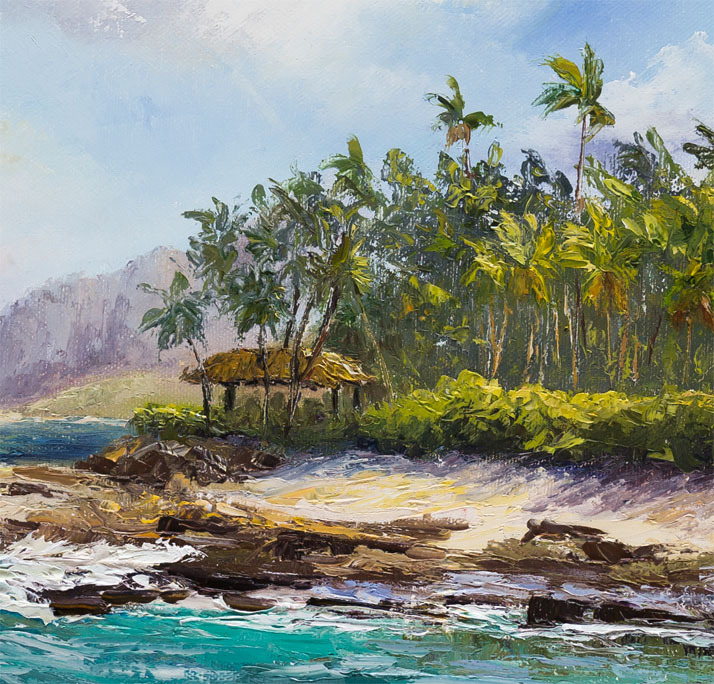 "Good Morning Paradise" in the studio. This past June, I was lucky enough to return to the beautiful island of Kauai for some more plein air painting. This was the first time traveling with my new Soltek Easel, rather than my homemade plein air contraption of the year before, so I was very excited. 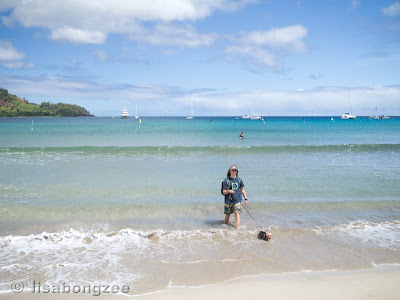 I am glad inter-island travel does not require much packing as far as clothing is concerned – a few t-shirts and shorts, some sunscreen and a hat and you’re good to go. 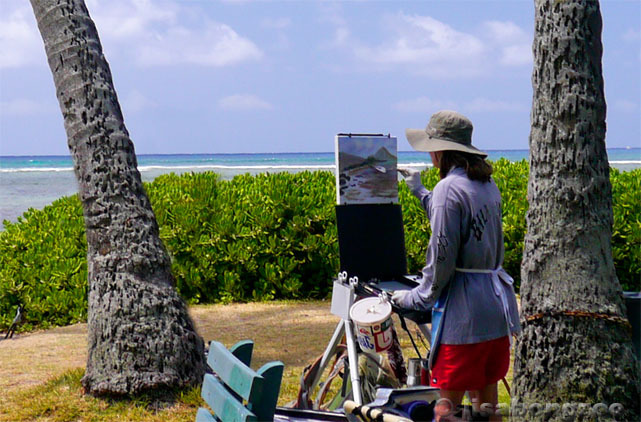 With plein air painting though, you must reserve one entire suitcase for all your painting supplies. 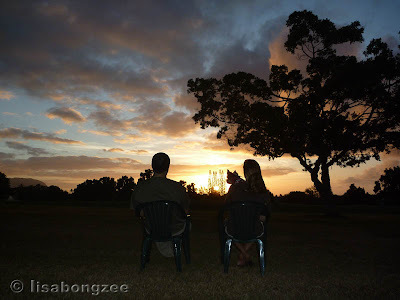 Here we were, one year later, back on Kauai. It felt as if we were just here! 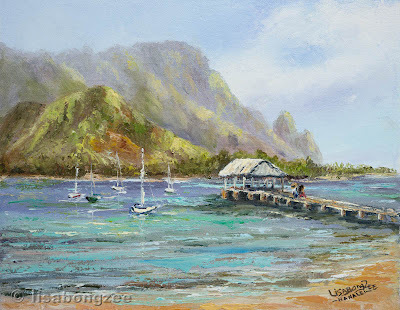 We headed for Hanalei Bay, one of my favorite places on the island. It was a gorgeous day and Brighton enjoyed a dip in the beautiful turquoise waters, as we walked the entire length of the bay. 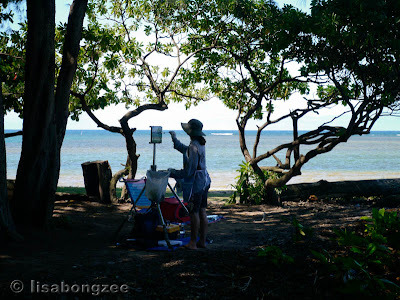 The next morning, we headed out early, with painting gear in tow. The day was not quite as perfect, with rain showers off and on throughout the morning, but it was still a great day to paint. 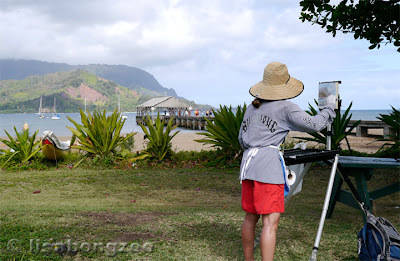 I had plein aired at Hanalei Bay last year, and decided to try it again, this time from a little bit different vantage point. 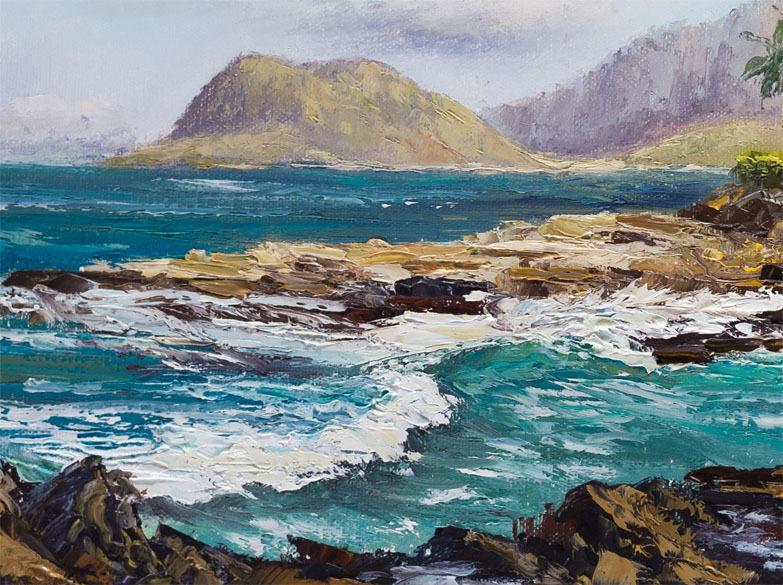 Also, this year, I was attempting to stick with my palette knife vs. brushes, so this made things quite different. 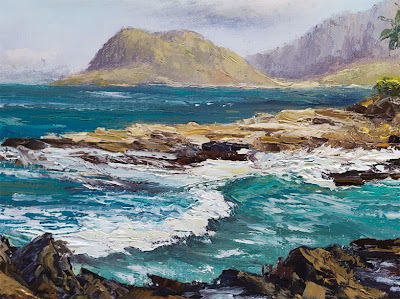 I did have to resort to the brush a few times, but about 80% of this plein air painting was done with the palette knife. 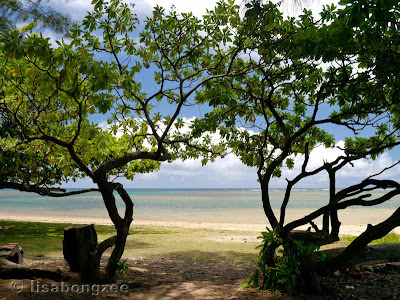 The next day, we headed down to Anini Beach. The water here was amazing, with every shade of turquoise and aqua imaginable. Unfortunately, for some reason, the camera couldn’t quite capture it. I decided to make an attempt on canvas. The day was blazing hot, so I set up in the cool shade and got to work. It was late afternoon, and the wind had picked up by the time I finished. I was now freezing cold. It felt so good to go sit out on the sand afterwards and thaw out. We headed back to Hanalei the next morning and noticed the surf was up a bit. We wished we had brought our boards. I wanted a day of rest from painting, but vegging on the beach was not quite cutting it. (Although Brighton didn’t seem to mind just chillin’). We drove to “Backdoor Hanalei” and rented a board. Although it’s not the same as having your own board, we did get to spend the day catching a few decent waves. 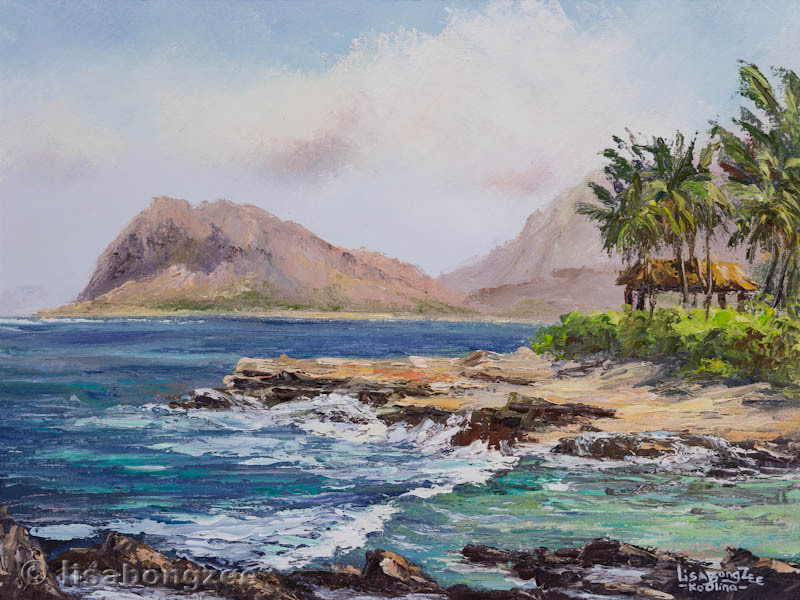 And sitting out there looking back at the shore, with the gorgeous green mountains full of waterfalls, instantly brought a smile to my face. How lucky I was to be here, enjoying this ! We were pretty pooped from having surfed all day, so we decided to just hang out at the condo. It was a beautiful afternoon, and our place had a nice view overlooking the golf course and a bit of ocean. 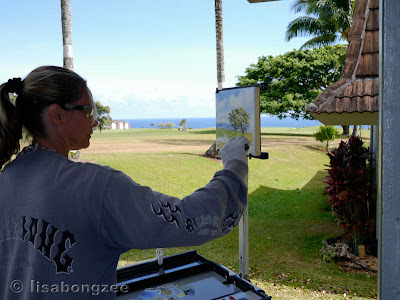 I set up my easel on the back lanai and painted the view from here. 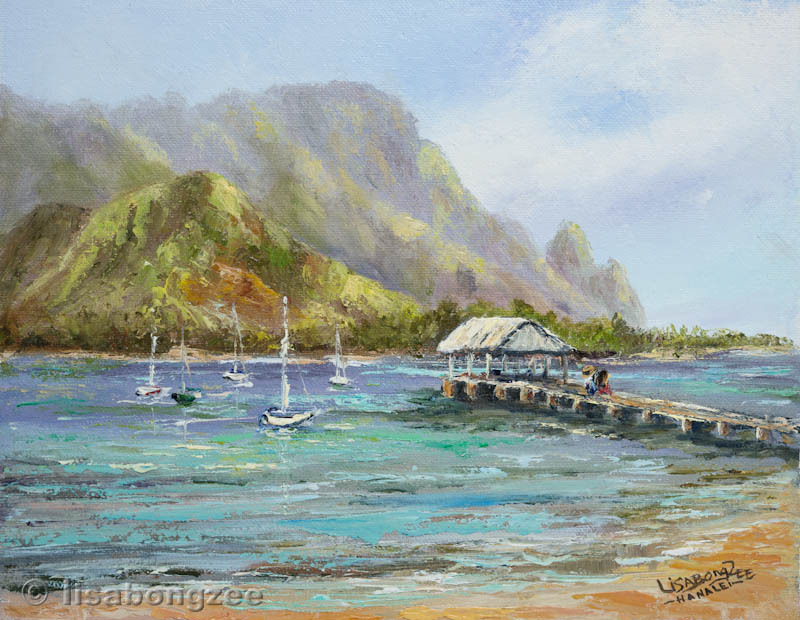 A beautiful evening on Kauai's north shore. 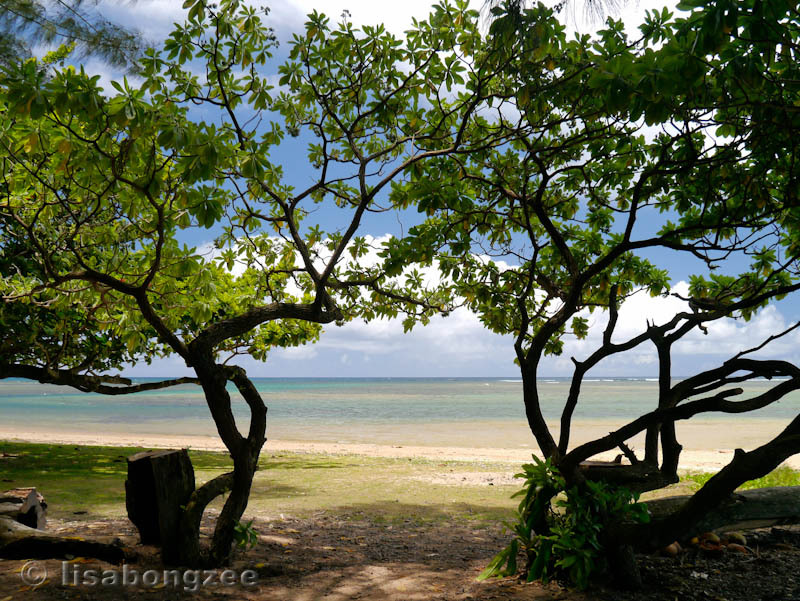 One morning, we drove down to the south side of Kauai and spent the day visiting the National Tropical Botanical Gardens. What a place! We only had time to see the McBryde Garden, (will have to return again to visit the Allerton Garden), but it was pretty amazing. 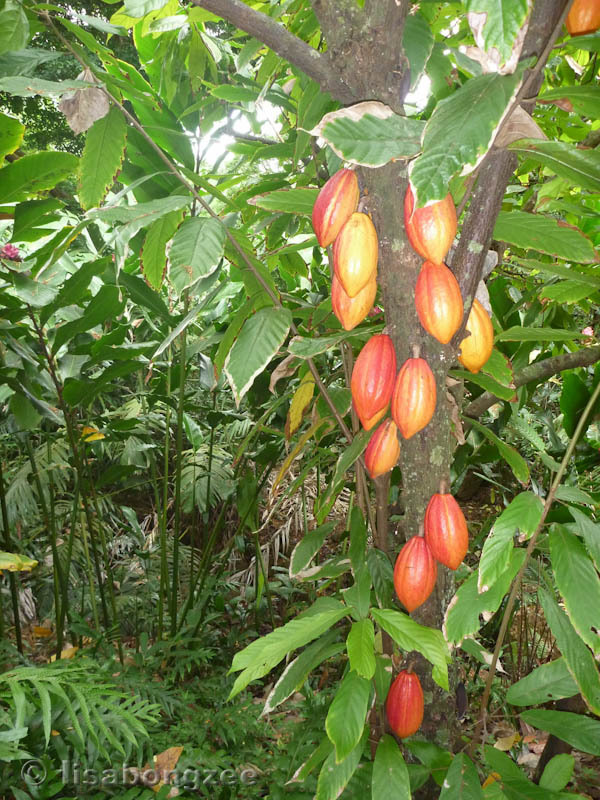 One of the neatest and most unusual plants that caught my eye was the Theobroma cacao (or cocoa tree). 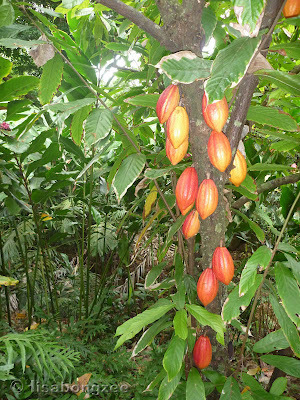 Hard to believe this is where chocolate comes from. We were getting hungry now. But not for a Hershey’s bar. We were craving really good Hawaiian food. 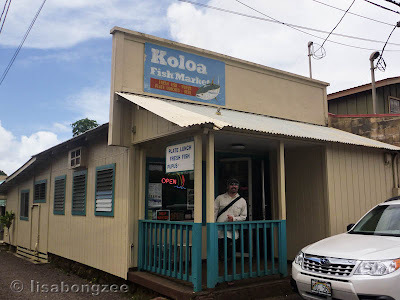 The garden tour employee suggested we give “Koloa Fish Market” a try. She was right on. 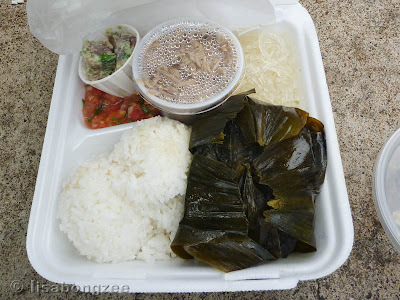 It was a delicious laulau plate (the spicy ahi poke was awesome too), and it was reasonably priced for all that you get. We probably would have never found this place on our own. It is in the little town of Koloa, near the Big Save Market. Be sure to check it out next time you are there. Bring cash though – it’s all they take. The employees definitely have the Aloha Spirit, and they went bonkers for little Brighton. We went back a second time to try their fresh ahi plate, which was also ono-licious. We would have eaten there a third time, but they were closed on Sunday! Well, I shouldn’t say “eaten there”. There is no room to eat there. It is walk in, order, take out – barely enough space for 5 people to stand. But there are many nice parks and beaches to take it to and enjoy the Hawaiian outdoors along with your great meal. 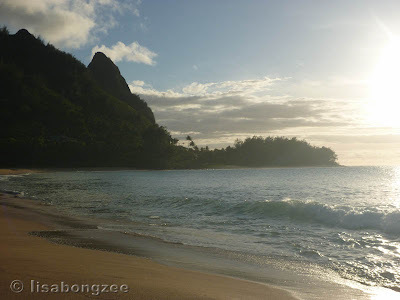 We spent a day at Shipwreck’s Beach, which is also on Kauai’s south side. The weather was gloomy and overcast, but it never rained. 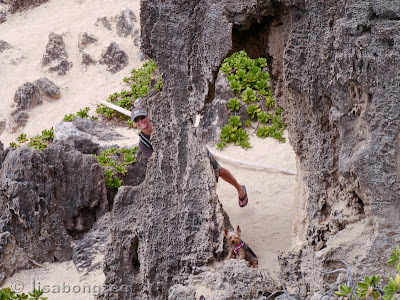 There are some very unusual rock formations in this area, and Brighton had fun climbing around on them. 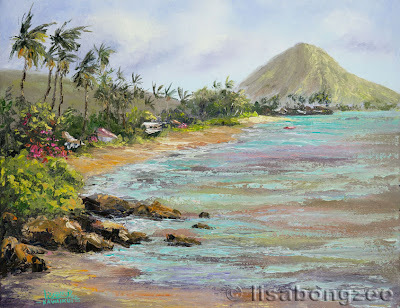 I decided to paint here one evening. Luckily, there were tons of Honu (turtle) swimming around in the waters right below me. They kept Dean entertained. 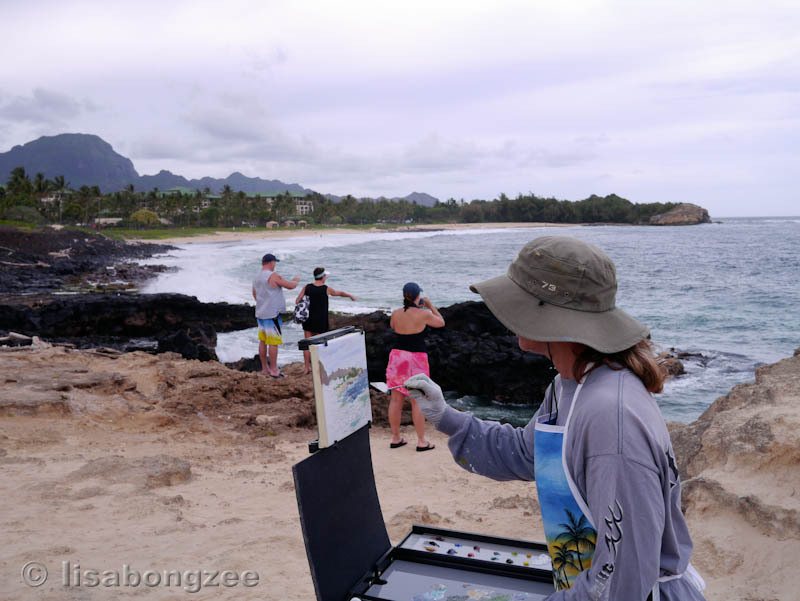 They also did a good job of distracting the many people that came down to the cliffs, I don’t think they even noticed me painting there! 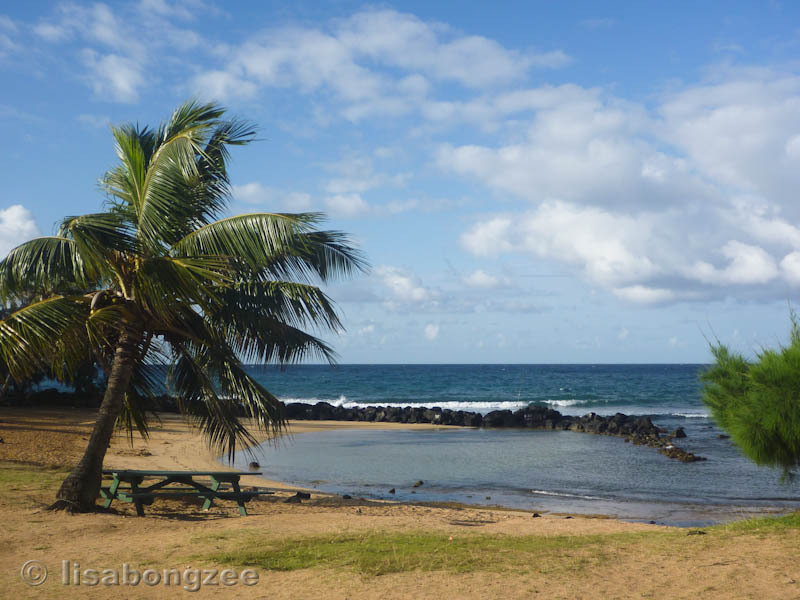 Our last day found us at Poipu Beach. 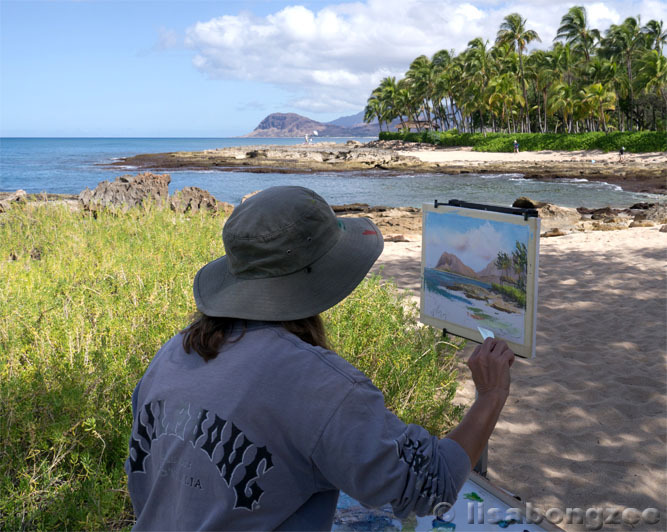 What a picturesque little place to plein air. The day was nice and sunny, the air was cool. 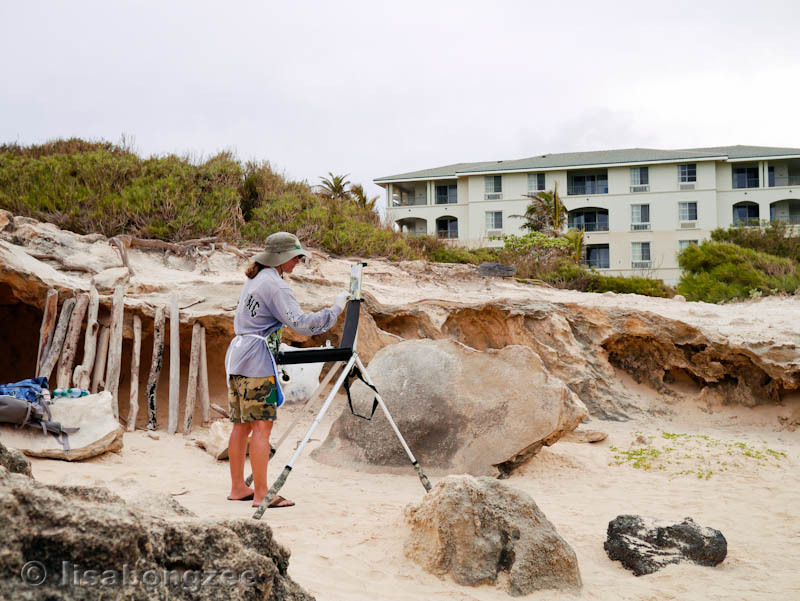 The lifeguards had their hands full with the tourists that were attempting to snorkel without knowledge on how to do it. 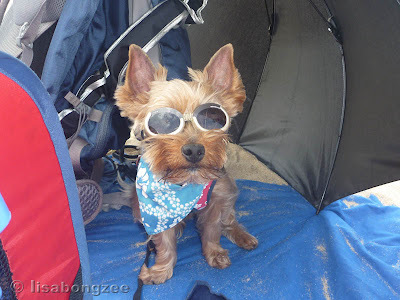 We saw more than a few rescues that day and it reminded me just how hard they work to keep everyone safe! Even though those gorgeous Hawaiian waters look enticing, you must remember to use common sense. 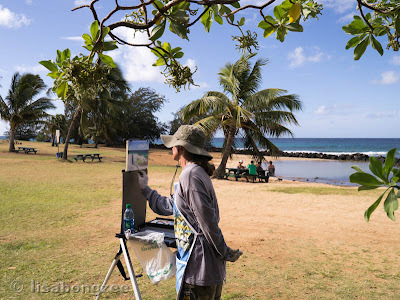 Our Kauai plein air vacation was everything I hoped it would be, and more. 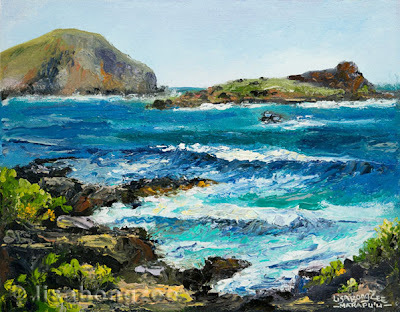 I got quite a bit more palette knife plein air experience in, and may soon be ready to leave the brushes at home! A plein air palette knife painting I did a few months ago from Kawaikui Beach Park on the south east side of Oahu, Hawaii. 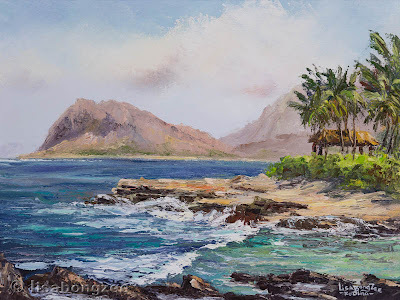 Makapu’u is one of my favorite beaches to paint plein air. Here was one of my first plein air paintings using the knife.